These are excuses not to challenge yourself. 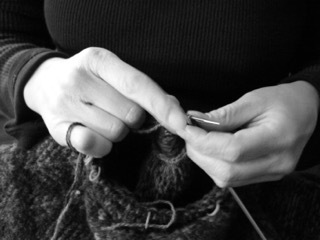 You need to start out with a sweater project that is not overwhelming. You don’t start out with a Fair Isle or a cable sweater to with, choose something that is within your comfort zone and easy. For a first sweater I like to start people off with a rolled collar raglan sweater. This sweater is knit in the round. So, for the most part you are just knitting except for the ribbing. It comes in a wide variety of sizes, so fitting the sweater to your size is not a problem. I find that people tend to over estimate their size, so I would suggest that you find a sweater or other garment you like that fits at home, measure the chest size of that and go with that size. Also it is very important that you come to gauge. It is sure way to have problems with the fit of your sweater is to be off with your gauge. So take the time to do a gauge swatch and after you begin the sweater check to see that you are still coming to the correct gauge. Take the plunge we can help you get started. We have the pattern for the rolled neck raglan and beautiful yarn to knit into a beautiful sweater you can be proud to wear.